It’s race day! A cold breeze gushes through the crowd. Runners quickly jog in place to stay warm. You can see your breath in the coolness of the air. Shivering, you count down the minutes until start time. 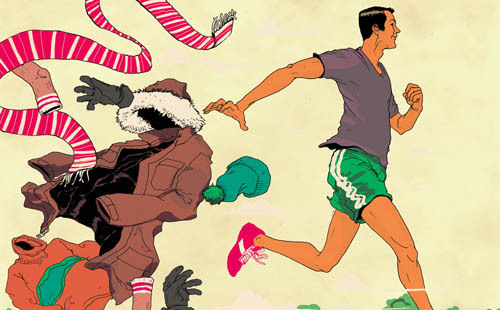 Your outer layer will be discarded later, but for now it’s keeping you warm before the race. The race finally begins and you’re content with this outer layer. It fits snugly around you, giving immediate warmth and comfort. But then something happens. Your body thaws out, gradually heating up to a full sweat. This shirt you earlier couldn’t do without feels cumbersome, causing you much distress. You’re ready to throw it off. You literally peel it off and toss it, knowing you’ll never see it again. But at this point you don’t care because you can run with more ease and freedom. Getting rid of the sweat shirt lightens your load. As you continue running along the race course, you notice a mass of shirts and jackets strewn across both edges of the road. You realize you’re among other runners who know this truth: you can’t run efficiently unless you throw off the things that weigh you down. Should we not have this same attitude with our sins? The hindrances entangling us—weighing us down. They utterly leave us burdened and miserable. But we often convince ourselves we’re okay with them. We think they’ll keep us comfortable, snug and protected from the cold, distant world. But we can only go so far before we start to realize we’re getting uncomfortable. Our soul is miserable with this added weight. We feel burdened with anguish. Feelings of defeat hinder us from walking in victory. The verse in Hebrews tells us to literally throw off our sins. A runner who’s fallen into her perfect stride isn’t going to slow down, prance over to the side of the road and neatly lay her old sweat shirt down. Of course not! Just when she notices the change in her body temperature, and feels the heat inside, she knows it’s time. She quickly peels off the cumbersome sweat shirt, tugging furiously to get it over her head. And with all her might she’ll fling it as far away from her as possible. That, my dear friend, is what we are called to do with sin. Just when we recognize the change in our thoughts. The change in our heart. The change in our attitude. We detect something isn’t right. We feel miserable. Maybe it’s selfish thoughts. Perhaps it’s a prideful action, hurting our loved ones. Or maybe we lash out with angry words to defend our way of doing things. Then we feel weighed down with guilt we weren’t meant to carry. Anguish rises up inside. When we recognize this, that’s when we grab the ugly thing it really is and strip it off. We hurl it out of sight and into the forgiving arms of Jesus. He’s strong enough to catch those sins we’ve thrown at Him along our path. He has the power to forgive and redeem because of what he did on the cross. And then He does something incredible; he hurls our forgiven sins completely away from us…never to be seen again. READY? What are you allowing to hinder your walk with Jesus? Are you clinging tightly to a certain sin? Are you ready to call it what it is and throw it off? Ask God to show you what is weighing you down so you can cast it off and run your race in victory. GO! Lord Jesus, I come to you humbly and ask you to show me the sins I’m allowing to weigh me down. Help me acknowledge them before you. I confess them now and ask your forgiveness. Soften my heart so I can be more sensitive to the sins that grieve your heart. Help me let go of anything that keeps me from walking in victory. Amen. ← Watch Out for Black Ice! Thanks for your encouraging words. I love how God has opened my eyes to SO many parallels between running and the journey of faith we are on as Christ followers. He’s given me the words, so I give the glory and credit to HIM.